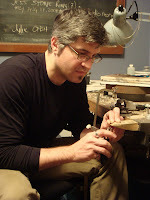 For the Love of Jewels...: Chuck Domitrovich: Etsy Excellence! I heard about Chuck Domitrovich through Etsy. He was profiled on the site and I was enamored first by his devotion to giving back to his community but also by his phenomenal success on Etsy. I have a site there too though mine has nowhere near the 1,400+ sales Chuck has enjoyed on his site, DownToTheWireDesigns. And since the topic of Etsy has been a lively thread on the Orchid forum recently—with designers questioning whether it is a good outlet for their work, I thought Chuck’s story would resonate with the community. Chuck quit his job as a machinist about a year ago, and now makes a successful living creating and selling jewelry. Quitting my day job had been a dream of mine for a long time. Leaving that job was made more difficult by the fact that I was well-paid and was allowed to have a very flexible schedule. It was easy to work there and pursue my career as a jeweler at the same time and the steady paycheck was a comfort. But I began to realize that even though I had managed to structure the job to fit around the demands of my jewelry pursuits, that every hour I spent at my day job was an hour not invested in my own business. In the end, despite the benefits of keeping the job, it was ultimately holding me back. Since quitting for good, I have not looked back. It has been a struggle with the recent downturn in the economy, but I had a pretty realistic perspective on things before quitting. I knew it would be a challenge and that success was something I would have to work at and would not just achieve overnight. I am confident that I made the right decision and am happy to be taking this opportunity. I love the name of your company! Does it have to do with making the decision to leave your previous job? The name came long before the job and is based on two things. The first is that after graduating from the University of Washington and being without access to a studio, I took up wire work. Mostly I was doing the beads and spirals thing but one day I stumbled onto a design that reignited my desire to be a jeweler. Soon after that, I quit my job and used the money I had saved to buy some tools and equipment and start my own workspace. The name derives from this earlier style which was still heavily dependent on wirework. But it also alludes to an unfortunate gift that I seem to have (or is it that I am cursed with it?) where I always seem to know exactly how much time any given piece will take to complete. So in that sense, I am always finishing things at the very last moment. You have been highly successful selling on Etsy....what do you think it takes to break through the crowd? What is your best tip for Etsy success? I am in most ways a very low tech person. My computer and even my camera skills really only go as far as the needs of my shop. So while I have given some of the social networking sites a try and have installed the Google analytics to my Etsy shop, I still tend to favor low tech methods of reaching people. When I started on Etsy, I would look for every opportunity to promote myself. If people weren’t visiting my shop, I would make myself a presence on the rest of the site and they would see me and get familiar with me there, hopefully checking out my shop eventually. To this end, I basically devised a series of publicity stunts to make myself stand out from the crowd. In one of these, I went through every single archived page of the Etc. forum and posted happy birthday wishes to every old out-of-date birthday thread ever posted that was not attached to a birthday sale. The forums were in chaos that day and it took quite a while before everyone knew what was going on—but everyone who was paying attention suddenly knew who I was. My advice to others would be to look for every opportunity and know that many of them won’t come in the prescribed forms that everyone else is looking to. That said, the best way of standing out is for your work to stand out. If your work is similar to that of others, it is always going to be a struggle because you are always going to be competing on price. If your work is unique, then people have to buy from you if they want it. Also, the more skilled you are, the less competition you will have. If your work is similar to that of many others, take the classes you need to learn the skills that will set you apart. You seem clear on the notion that it takes constant work and vigilance to keep up with online selling. How much time do you think it takes to be effective doing this part of the job? I think that depends on how disciplined you are. You need to realize that part of each day will need to be spent at the computer but know also that it is easy to lose yourself there. If you can, set aside a part of each day to deal with answering emails, listing new work, and perhaps updating your blog, but limit yourself to that time. I would also encourage everyone to spend a little time exploring the Etsy site. If you know what is there and how it works (for instance, being familiar with all the options for buyers to find things on the site) you will be better able to use those things to your advantage. You focus on a great deal of pattern in your pieces...why does that interest you? 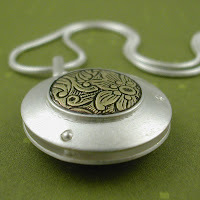 Patterns are a good way to add texture to a piece—to break up the monotony of the plain metal. Since I do not work much with color, mixing different types of metals and textures into a piece can make it more visually interesting. I find that even in my sterling and titanium pieces I often am scoring or hammering the titanium panels or wire for the same reason. The Vienna Workshops were a very idealistic experiment. They sought to use modern technologies to make art accessible to the masses. In many ways they were not successful, but they were one of the first serious arts groups to even make the effort. I try to do the same in my own work. Even though I have sold at high end galleries, it is very important to me that my work is available to all. Growing up in a working class family, it would never feel right to me to sell only work that no one I know could afford to buy. As an offshoot of the Arts and Crafts movement, the Vienna Workshops had a very clean sense of design that appeals to me. Much of my work is based on simple geometric shapes with contrasting metal tones. 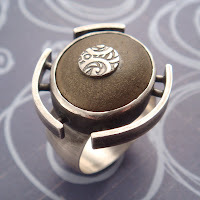 The patterned metal that I use in my work reminds me of the innovative materials that they used in theirs. You also have said you are inspired by African and Pacific Island jewelry. What about it appeals to you? I have always found tribal jewelry intriguing both because of the textures that are employed in the work and the sense of conservation that is inherent in it. Much of the texture in this work is a result of the technologies that is being used in its creation. Often pieces are simply tied or wired together, with the binding agent becoming a part of the aesthetic. So a shell, stone, or bone, will have its smooth surface broken by the wire or cord connecting it to the other elements in the piece. In many pieces, the elements are repeated, with those layers adding texture to the piece. In an age of machined goods that are often smooth and perfect, I find that texture and imperfection point to the human origin of a piece—I find that very refreshing. 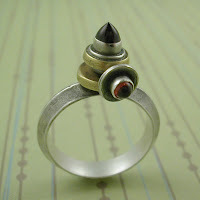 I love the fact that absolutely anything is seen as a legitimate object to be incorporated into the jewelry. Many of the elements are natural—teeth, bones, shells, stones, even the skulls of small animals—but you are just as likely to see electrical wires, or buttons, or pieces of aluminum cans used. And when something is damaged or broken, instead of it being thrown away, the piece is often repaired, with the rivets or wire that is used to patch the piece, adding to its overall design. Yet it is very important to me to make my work distinct from the styles that influence it. This is especially true in the case of the tribal work that I admire. Taking from this work without trying to reinterpret it just removes it from its cultural context and does it a disservice. I would no sooner take directly from this work as I would any other artist selling on Etsy or anywhere else. It just feels wrong to me. With my production line work, I try to keep things simple using bold shapes and strong lines. I do not use much color, so I use texture and pattern to catch the eye. I strive to create pieces that are classically proportioned and could have come from some time in the past while still being stylish today. I also like to be playful in my work. Making jewelry is fun for me and I like to share that sense of fun with others. So in that sense, I like work that is versatile. 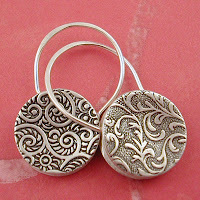 My padlock earrings can be worn with one of two patterns showing, making them essentially two pairs of earrings in one. I like work that includes moving parts—like my orbit ring series. I like to make pieces that go beyond just making a visual impression to include sound. My round rattle necklace achieves this. In these ways, I try to make work that exceeds expectations. In many of my one of a kind pieces I try to strike a balance between the natural and the industrial, with each piece being sort of like a talisman of the modern age while yearning for a more ideal, less complicated past. With these pieces, I often try to achieve the feeling that they were dug up at an archaeological site—broken and from a distant past, yet still somehow speaking to us. I first noticed you when a story was published about your commitment to donation of your work for charity. Tell us about this... Has the economic meltdown changed or affected this goal? The financial meltdown was part of the inspiration for me doing the donation work. I was asked at my one big show of the year to donate something to a charity auction, and my first reaction was to be put off by the request (mostly because of when and where the request occurred). It was only upon looking back at that request that I realized just how needed it was in this economic environment and how very little it would impact me to give to virtually anyone who asked. So, I got the idea of committing to giving one donation a week throughout the year. So far, things have been slow. I have given away only one donation through the first eight weeks and was gone for two of those weeks on vacation. But I have 3 or 4 donations scheduled to go out this week and a few more lined up after that. I have also come up with a backup plan for the end of the year in the event that I am still behind schedule. My plan is to ultimately donate 52 necklace and earring sets to charity this year and I am determined to do that in one way or another. Aside from Etsy, where can people see your work? My work can be found in three galleries here in Seattle: La Tienda, Crackerjack, and Frank & Dunya. I also post photos of some of my older work and more upscale work—pieces not available on Etsy—on my blog and on my Flickr account. Finally, I have one ring in the Lark Books 1000 Rings book and some collaborative work in Lark’s 500 Pendants and Lockets and The Art of Jewelry: Polymer Clay. There are more collaborative pieces in Schiffer’s Art Jewelry Today as well as in both the 2006 and 2007 September issues of Art Jewelry magazine. It was a pleasure getting to know Chuck! What a thrill to see a person take a chance, find success and give back; even amid this terrible economic time.